I explained my idea of a 3D sonar by mimicking Echo-Location using cell-phone technology (Echo-Location used by bats to fly in the dark AND by blind people) to our team and my project partner. Of course, I had to explain my project, but he and the team were able to understand it right away (Presentation pics). Amber joined our team and she could immediately tell what was described in my project partner’s diagram. 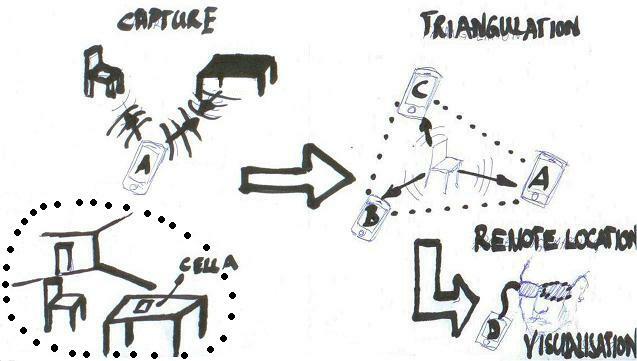 This is really the core concept of my idea to mimic this so-called Echo-Location, but use Cell-Phones to capture objects or even architecture, then use more than one cellphone to triangulate the position of the objects and display them through a visual system (could also be a non-visual system: shown in the Computer Game Darkgame – but be aware of the lack of documentation of the project).